Bigwigs Out At Microsoft And Apple. Now What? : All Tech Considered Steven Sinofsky and Scott Forstall, instrumental figures at two of the world's biggest tech companies, have left their positions. What does that mean for the future of those companies? 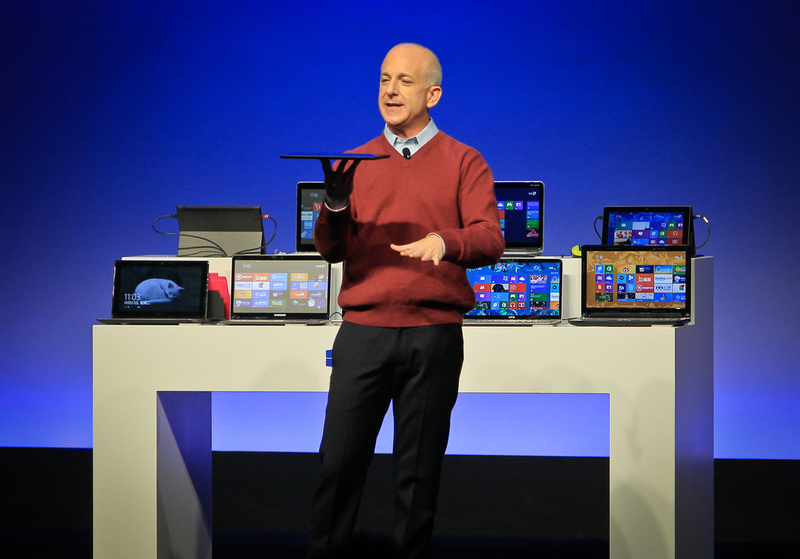 Steven Sinofsky introduces a new Microsoft tablet computer and Windows 8 software to the media in Shanghai on Oct. 23. The former president of Microsoft's Windows division has since left the company. In less than a month, two instrumental figures at two of the world's biggest tech companies have left their positions. Now industry watchers wonder whether the departures at Microsoft and Apple will mean dramatic changes of direction for the tech giants. On Monday, Microsoft announced that Steven Sinofsky, an employee at the company for the last 23 years, and head of the Windows unit since 2006, was leaving. The news came just two weeks after Microsoft launched Windows 8, the company's boldest release in decades, whose development Sinofsky oversaw. It also comes just a few weeks after Scott Forstall, the head of Apple's iOS for the past several years, was fired, along with retail chief John Browett. 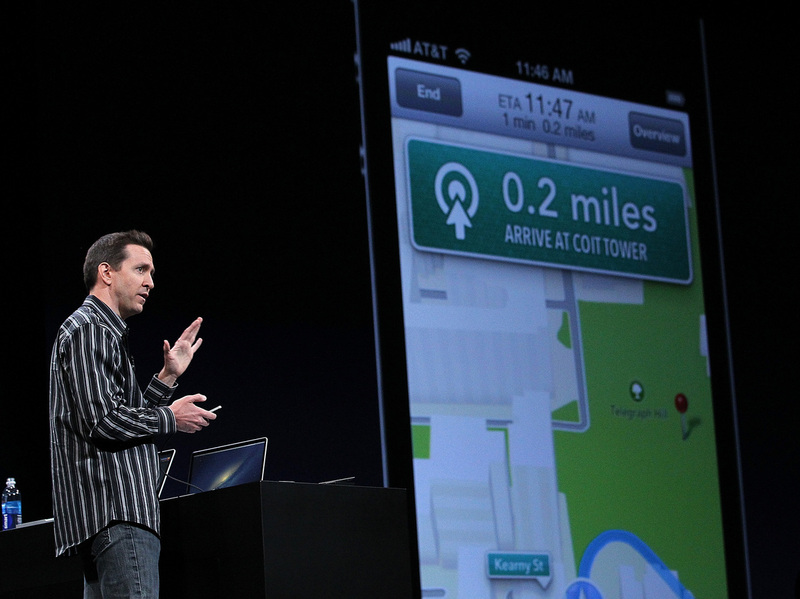 Scott Forstall demonstrates the new map application featured on iOS 6 during the 2012 Apple WWDC keynote address in San Francisco in June. Apple announced in October that he will leave the company. And though there is more than one commonality between these executives — both were controversial characters considered CEOs-in-waiting — experts including Wired senior writer Steven Levy caution against drawing too many comparisons between two people whose companies, and whose respective roles there, were different. And yet these departures both raise essential questions about Apple and Microsoft — especially since they come at such integral moments in their histories. For Microsoft, the question is what implications Sinofsky's departure has for the company's big gambles — Windows 8 and Surface, a series of tablet computers. Reviews are mixed for the two products and it remains to be seen how successful they will be in the long term. "You don't know what's going to happen. These products are done and delivered. There's a latency period where you find out what losing Sinofsky means for Microsoft," Levy says. Both products are an attempt at renewed relevance for Microsoft, whose influence has slipped in an age in which mobile of tablet devices are increasingly dominant. With Sinofsky and his contribution accounted for, Business Insider's Jay Yarow says, the effort must continue to ensure Microsoft's comeback. "These new executives are going to have to come up with a vision for Microsoft to compete with iOS and Android. And when once they've done that, they're going to have to execute against that vision. That means delivering strong software on time, something Sinofsky did over and over again," he writes. Forstall's departure, meanwhile, comes on the heels of Apple's first major shortcoming, the new Maps program, for which Forstall was considered "directly responsible." According to reports, Forstall declined to sign a letter of apology about the failure. "Maybe he's a fall guy for the Apple Maps thing but [the firing] is not something that happens because of one error," Levy says. Indeed, Forstall was a divisive character at Apple. And The New York Times reports that his removal was partly an effort to create more harmony among Apple's top executives. But Forstall was perhaps as brilliant as he was unpopular. Former Apple engineer Michael Lopp described Forstall as "the best approximation of Steve Jobs that Apple had left" and said there was chatter among Apple employees that Forstall was "the only legit successor to Jobs." For Apple, there is now room for someone else to take on the mantle of visionary. "I guess now we know it's not Scott. It's still an open question whether [Jonathan Ive, Apple's vice president of industrial design] comes in or some of the other people, or whether in five years there could be someone else." Levy says. Ive's role has now expanded to encompass the design of Apple's "human interfaces." Essentially, he'll now be in charge of both software and hardware. Adam Lashinsky, senior editor-at-large for Fortune, says the move "solidifies a change in direction. Already the trend for years was that Mac software predicted what happened with the user experience. That's been flipped on its head. Mobile software is dictating user experience across the company including on the Mac. That's one half of the development. If they succeed, you'll have a seamless experience on any Apple product whether it's a mobile product or a desktop product." In addition to Ive, Lashinsky says, there's no shortage of emerging talent at Apple to help shape that future. The same goes for Microsoft. "Both of these companies have deep management benches. People forget that because we don't know the names of the people below the famous people," Lashinsky says. And as for the recently departed, Sinofsky, for one says, that he'll "seek new opportunities that build on these experiences" at Microsoft. Levy says he imagines that Forstall could move on to make similar contributions. Meanwhile, he says, the companies they left will forge on. "I don't really think in five years looking back we'll be saying, 'What would have happened with Sinofsky or Forstall?' On the other hand, one or both of those guys could start a startup that will make profound changes to our lives," Levy says.